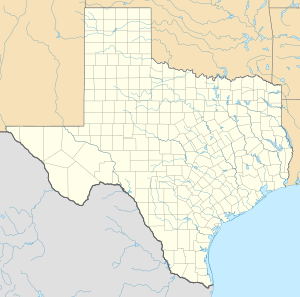 Bergstrom Air Force Base (1942–1993) was located seven miles southeast of Austin, Texas. In its later years it was a major base for the U.S. Air Force's RF-4C reconnaissance fighter fleet. It was activated on 19 September 1942, as Del Valle Army Air Base on 3,000 acres (12 km²) leased from the city of Austin. The Chisholm Trail ran through the tract. The name of the base was changed to Bergstrom Army Air Field on 3 March 1943, in honor of Austinite Capt. John A. E. Bergstrom, who was killed at Clark Field, Philippines. The base was renamed Bergstrom Field on 11 November 1943, and became Bergstrom Air Force Base in December 1948. Initially, Bergstrom was the home of troop-carrier units. It was declared a permanent base after World War II and was at various times assigned to the Strategic Air Command and the Tactical Air Command. After July 1966 it was under the control of the Tactical Air Command and housed the headquarters for the Twelfth Air Force, which was responsible for all Tactical Air Command reconnaissance, fighter, and airlift operations west of the Mississippi River. In the 1960s, Bergstrom Air Force Base became the place where Air Force One flew into and out of often. It was the airfield that Lyndon Johnson flew into and out of when president when traveling between Washington and his ranch in Texas. During the 1970s, Austin's tiny municipal airport became crowded and noise complaints increased. 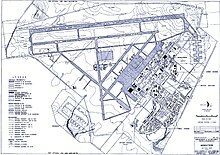 The city approached the Air Force in 1978 to propose a shared civil-military airport at Bergstrom, but the original proposal and further ones in 1981 and 1984 were all rejected. In 1979 the Concorde visited Bergstrom, followed by the Space Shuttles Columbia and Discovery aboard their carrier aircraft in 1981 and 1985, respectively. In 1990, Bergstrom ended up on a list of 75 military facilities under study for closure by the post-Cold War Base Realignment and Closure Committee. On 30 September 1993, Bergstrom was officially closed and a bond was raised for Austin-Bergstrom International Airport. Much of the former air base, including most buildings, trees, and structures, were completely demolished, with a few exceptions, such as the Twelfth Air Force Headquarters (which was converted into a hotel) and the original 12,250-foot runway. Air cargo operations began in June 1997 and passenger operations started in May 1999. Wikimedia Commons has media related to Bergstrom Air Force Base. This page was last edited on 21 October 2018, at 18:46 (UTC).